As part of the 60th anniversary celebrations for the club two walks were organised for 25 November. Members and friends stayed on the Friday and Saturday night at the comfortable IBAC Ski Lodge in Smiggin Holes. The short walk to Blue Lake is reported elsewhere with the 22 km Lakes Walk covered in this report. 13 excited hikers set off from Charlotte’s Pass car park at about 8.45 am after a short briefing and a group photo. Rain had fallen that night so everything smelt fresh with some early wildflowers colouring the landscape as we followed the gravel road towards Mt Kosciuszko. Blue sky gave way to building clouds with the forecast predicting late storms. The group was led by Peter Davis and comprised walkers aged from early twenties to mid-seventies. We stopped for a morning tea break at the bridge over the Snowy River, tucked in amongst the boulders to shelter from the breeze. The first of many snowdrifts was encountered at Rawson’s Hut. An unusually late dump of snow had left white stripes decorating the peaks. Dodging the side track to the Kosciuszko as we surveyed the looming storm clouds, the hikers turned north crossing another drift which obscured the first 150 metres of the Main Range Track. As we traversed Muellers Pass the views to the west were stunning as always in the clear mountain air. 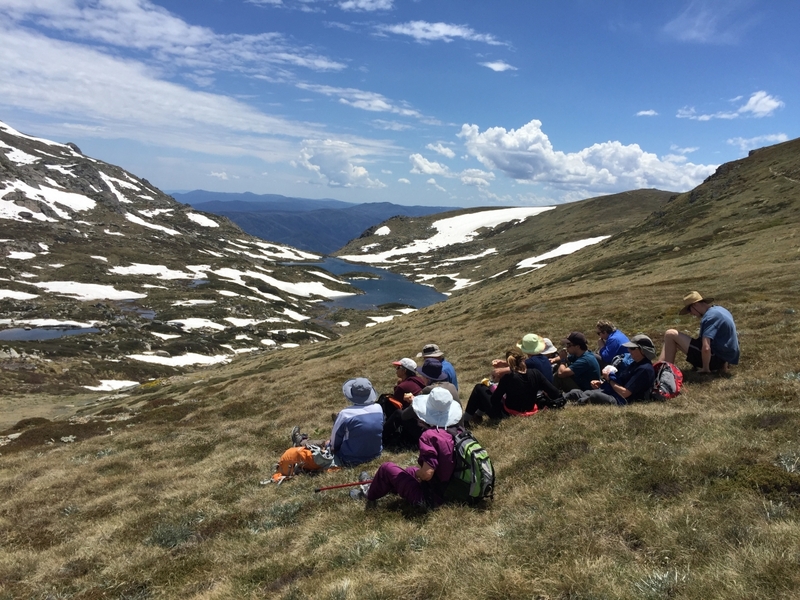 After tramping through a few more drifts we pulled up for a lunch stop above Lake Albina, reclining on the snowgrass below the ridge line with Mt Northcote at our backs. More drifts provided glissading opportunities for the hardier troops with a plastic bag making a lightweight toboggan of sorts. Cameras snapped as we crossed yet more snow on Carruthers Peak where we passed a couple of groups of happy hikers traveling south. The lookout southwest of Blue Lake provided a good spot for afternoon tea before the long descent, with one bump in the middle, down to the now much more seriously flowing Snowy River ford. The paved path down to the crossing is disintegrating under the onslaught of the extreme winters but the group managed this with no trips, but then there was the river crossing! Massive thunder clouds brewed close by with lightning providing added motivation to get back to the cars. Some walkers rock hopped and stayed dry. One fell heavily but luckily sustained nothing worse than bruises. Some tried the boots off and wade method whilst some just barged straight through boots and all, which was the safest but coldest option. A short pull up to the cars by 3.30 as the thunderstorm threatened but held off and back to the lodge for a warm drink meant that the day’s walking was done. At Smiggins it was time for stories of walks past and future and even a 60th birthday cake to celebrate 60 years of walking in our beautiful mountains.